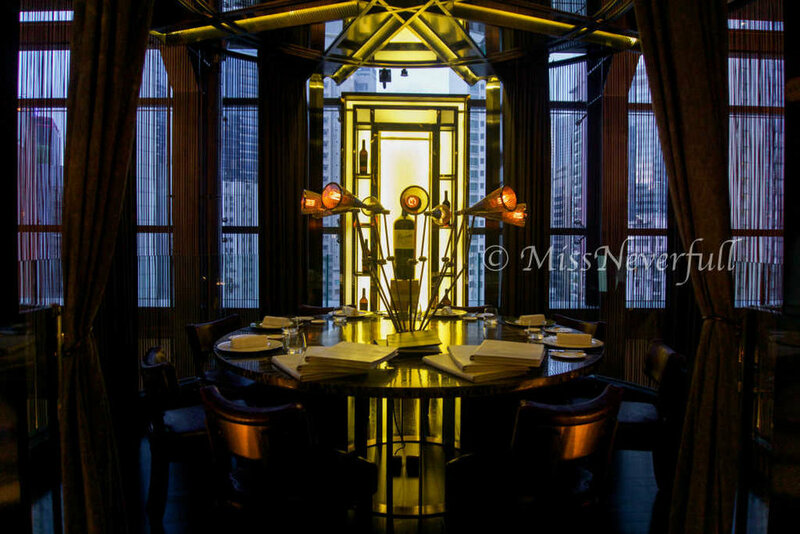 Vasco housed in the new landmark PQM in Central, offering contemporary Spanish fine dining in a chic setting designed by the famous interior designer Joyce Wang. The kitchen is currently helmed by the Michelin-honoured chefs Paolo Casagrande fromtwo-Michelin-starred Lasarte Restaurant in Barcelona, the team was trained by Chef Martin Berasategui who had owned 7 Michelin stars totally. Although it was only Vasco's first birthday this late June, i have heard a lot good things happened there. The Basque-inspired restaurant was under the Drawing Room Concepts, the same company responsible for other popular restaurants in the city including AMMO, Le Salon Restaurant et Croissanterie, Hainan Shaoye, SHIOK andMade in HK Restaurant. To get there you have to take the lift to 6F, walk through the entrance of its sister restaurant Isono, and Vasco is just upstairs. We had the Chef Tasting Menu ($1280) which includes 6 dishes, 2 dessert, with complimentary amuse bouches and petit fours. Most of the siganture dishes are only avaialble in the Chef Tasting Menu, such as smoked oyster, red palamos prawn, French piegeon, etc. Thus it is a best choice for a complete discovery experience at Vasco. Started with assorted amuse bouche: Olive with peach jelly; Rice crispy with Spanish cheese, dry tuna roe and chili sauce; Caramelized pistachio with curry; Pickled onion with trout fish roe - very appetizing snacks. 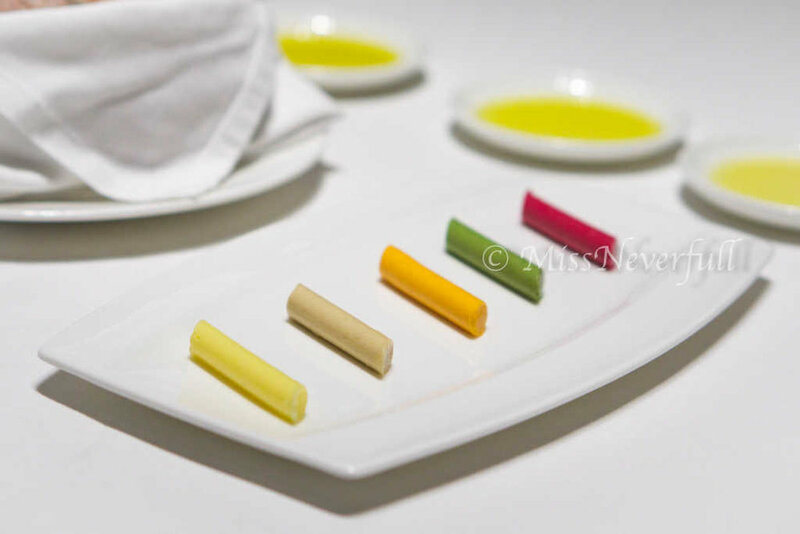 Then the server presented 5 different kinds of olive oil with different flavors to pair the bread. All of them were selection by the Chef. From the left to right were: banana, apple and tomato, almond, grass, lemon. Banana and grass infused were a bit stronger in flavor, while our favorites were apple & tomato and lemon, which have a very refreshing twist. The bread was also served with 5 assorted 'colorful' butter: salted, mushroom, tomato, spinach and beetroot. The later four were very unique, i loved the tomato butter best for its sweet-sour flavor, mushroom one was also lovely. The smooth butter works really well with the freshly baked sourdough with a crusty outside and a soft inside. The fresh mussel has a very clean taste, with a refreshing aroma and flavor from the bergamot jelly and lemon foam - another delicious snack to awaken out taste bud. I thought it was our first course but no, one more step before starting out real feast. Black garlic ice cream was very special, it paired very well with the juicy Japanese crab meat. The red pepper tartare on the side nicely enhanced the flavor, and the cucumber puree mixed with milt too balanced well. First dish was a Gazpacho (Spanish chilled soup), it was quite unique as the addition of strawberry, which brought a lovely fragrance and flavor to the creamy but refreshing soup. Marinated tuna was juicy and flavorful, while the pear sorbet brought another chilled texture and fruity flavor to the dish. It was a very fruity and refreshing starter with a fresh flavor from the ocean. The flaky iberico pancetta bread roll has a very deep taste, the special fragrance and savory flavor from the iberico made this simple bread roll very impressive. Loved its endless aftertaste. Lightly charcoal-smoked oyster was one of Vasco's signature dishes i came for. The strong smoky flavor with dreamy smoke diffused over the table after the server opened the lid, then appears a large piece of oyster laid on a bed of soft onion cream. The oyster itself too have a smoked flavor, simply umami and tender. The pretty 'pearl' on top of the oyster was made of oyster juice, which exploded in my mouth with a umami taste. The squid ragout too enhanced the sea flavor to the entire dish. On the side, the curry crispy bread as well as the rich onion cream made the dish more textural. A must-try! Used only the egg yolk part, the farmhouse egg has a perfect runny yolk - rich and indulgent, but so hard to resist it with black truffle. The clear duck consomme was very umami, and the grilled mushrooms balanced well. This is no doubt a plate of edible art - red Palamos prawn with sea urchin, the dish i came for. The prawn was large in side, with an incredibly rich texture and sweet flavor, which perfectly paired with the creamy Hokkaido sea urchin. Another highlight of the dish was the crumble powder made from prawn's head and shell, which was very umami and wonderfully lift the flavor of the entire dreamy dish. The seaweed seared asparagus and sea grape brought a touch of refreshment. This dish was seriously die-for. Compare to other kinds of (white) fish, the texture of monkfish itself was a bit more firm but i always enjoyed its slight chewy texture. The flesh was nicely cooked, simply umami. The seaweed poached lobster on the side was too very delicious. The idea of using white chocolate to pair with the dish was very interesting, but the outcome was very harmony. I also loved the black truffle mayo which brought a lovely truffle hint. In general, not bad but neither seriously impressive as previous prawn dish was too perfect. Another highlight of the menu was the French pigeon, which was perfectly char-grilled. Loved its fragrant skin seasoned with a pinch of sea salt, the pinky meat underneath was incredible succulent and flavorful. The sweetness and sourness of the pineapple puree balanced very well. 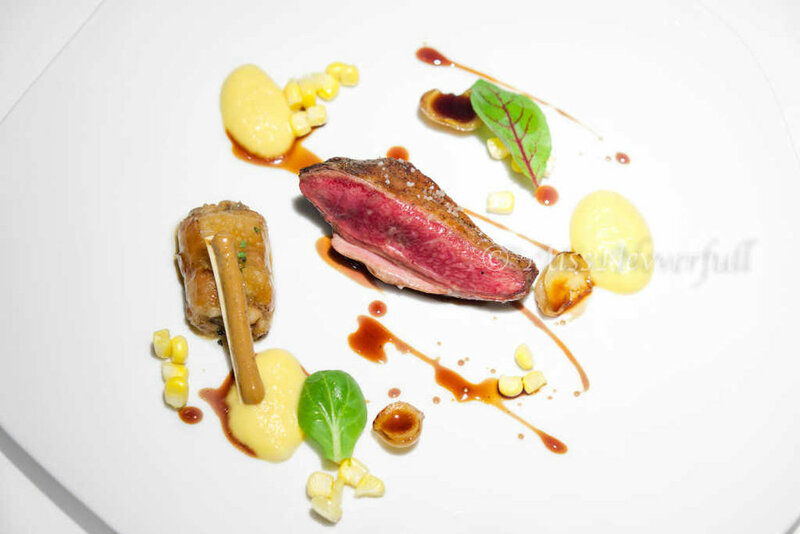 It was a more memorable pigeon dishes i had recently. 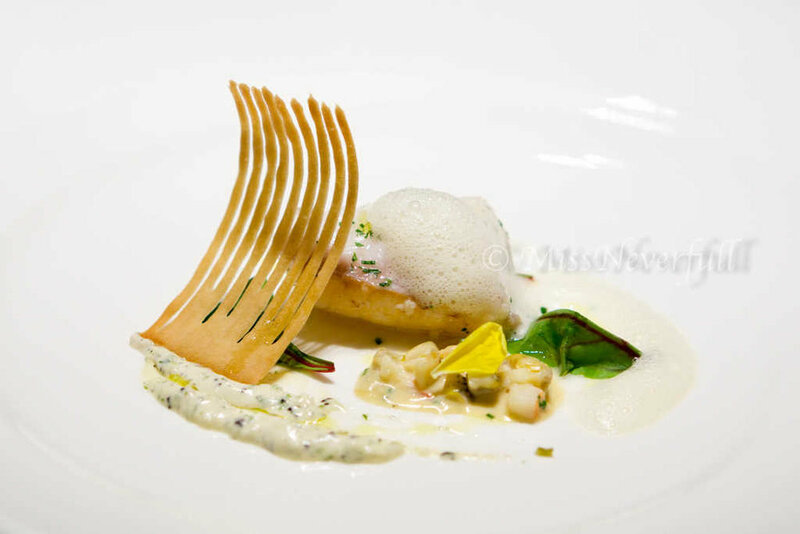 The alternative dish of the pigeon was the wild turbot, cooked in low temperature to get its melt-in-mouth tenderness. Side with black ink sauce and seaweed rock to enhance the umami flavor. The first dessert was very refreshing, consist of compressed melon which was juicy and naturally sweet. Side with lemon puree and to strengthen its refreshing flavor. A very lovely one to cleanse the palate. The second dessert featured the whisky ice cream with Domani chocolate in different depth and textures: outside with 65% dark chocolate and its crisp, and 75% dark chocolate mousse inside. The flavor of premium Domani dark chocolate was not bitter at all. The whisky ice cream and meringue on the side has a alcoholic hint and balanced very well with the chocolate. Love it! A good restaurant won't miss every single detail even the petit fours, it came in a very textured glass serveware, feature passion fruit macaron, blueberry jelly and hazelnut candy in different 'cones'. The mini tiramisu was served on the side, which was my favorite among the four snacks. Very moderate sweetness with smooth texture and a lovely rum flavor, it would be perfect if it was infused by coffee powder. This was one of the more impressive meals i had in Hong Kong this year. For most of the time, Michelin restaurants are more premium on my to-go list but to be honest, Vasco has been on my top to-go list for almost half an year, and don't forget the restaurant is only one-year old. The food was very impressive, very premium ingredients with wonderful culinary skills. The entire team was very friendly and efficiently. Although defined itself as a fine dining restaurant, the ambiance won't make you feel restricted but still very elegant and upscale, you would neither feel something is watching as the booth seatings guarantee your privacy. I will definitely come back next time, and wish to see it being featured on the next Michelin Guide.